See more objects with the tag flowers, upholstery, domestic interiors, furnishing fabric, curving line, large repeat, paisley. This is a Textile. It was designed by Maharam Design Studio and produced by Maharam. It is dated 2007 and we acquired it in 2008. Its medium is 76% polyester, 24% cotton and its technique is 2/1 twill (weft-float face) with continuous supplementary weft patterning. It is a part of the Textiles department. Massive Paisley, designed by Maharam Design Studio, is a wildly oversized, contemporary interpretation of the traditional paisley pattern, a teardrop shape usually filled with a profusion of tiny flowers. The paisley, or boteh, can be traced back to ancient Babylon, where a teardrop shape was used as a symbol to represent the growing shoot of a date palm. The palm provided food, drink, clothing (woven fibers), and shelter, and so became regarded as the Tree of Life, with its growing shoot being gradually recognized as a fertility symbol. The paisley pattern was popularized in Europe through the Kashmir shawls that were in fashion between the mid-18th and mid-19th centuries. The term “paisley” comes from the name of the Scottish that was the largest manufacturer of mass produced imitations of the traditional hand-woven shawls. By the mid-19th century, demand in Europe for Kashmir shawls was enormous and could not be satisfied. Prior to 1850, one man would weave a shawl on a hand loom; after this date, the method changed and several men or boys would weave a small section of a shawl, which would then be cut out and pieced together, a patchwork of small pieces, and sewn into a shawl by a shawl tailor, or rafugar. An order worked in this way could be completed in one-and-a-half months instead of the two to three years it would take to weave a shawl. Another, even faster, method to increase production was to embroider shawls, or to partially combine embroidery with weaving. Amazingly, with both these methods, joins cannot be detected and the design flows over the whole shawl. The scale of the paisley in Maharam’s textile is many times larger than the traditional form, which makes it appear almost pop art in its presentation. 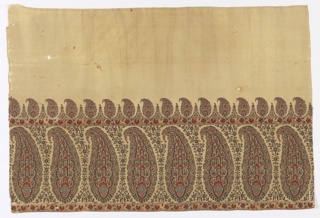 Cooper-Hewitt has a number of Kashmir shawls from the mid-19th century, as well as other textiles with the paisley design. In addition, the collection also includes wallcoverings and decorative arts objects with a paisley design. 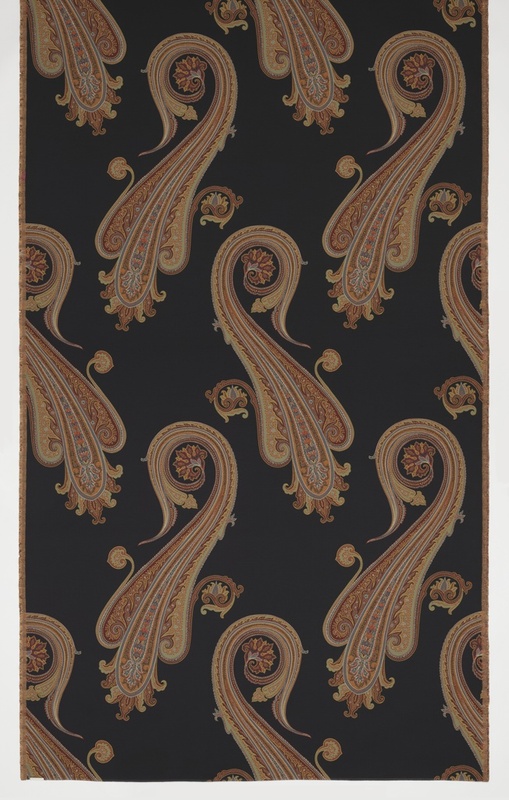 Massive Paisley fits into our collecting priorities by being both contemporary and reflecting on the museum’s own collection of traditional design forms, which includes paisley.